I have talked about how I have really not cooked since moving here. I have really maxed out with a grilled cheese sandwich. I couldn’t justify cooking for “just me” after 2 years of cooking so many meals for “us”. Not just us, my repertoire of recipes is a reflection of who I was cooking for… I learned his favorite recipes, learned to make things the way his mom did.. that sort of thing. Anyways. Last night I cooked. 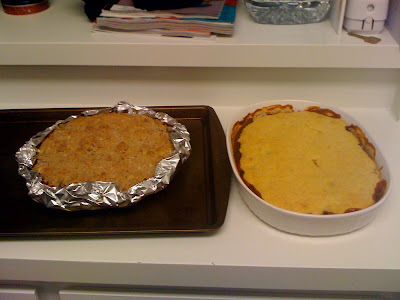 I cooked a casserole from my Aunt for the lunch club today and I made an apple pie for a potluck dinner tonight. I know I need to get over the not-cooking-for-myself thing… and I will. But it is nice to cook for people again. The chili-cornbread casserole is insanely easy. Probably should even count as cooking.. there are ways to make it more complicated… by, you know, making the chili or cornbread batter from scratch. I however used Trader Joe’s turkey chili, and Trader Joe’s cornbread mix…. you put the chili on the bottom, put the cornbread batter on top. Bake at 400 degrees for about 20 minutes… done. The crumb apple pie was an actual baking experience… and if I could chose between putting my energy into cooking or baking, I would pick baking every time. To prepare filling, melt 1 tablespoon butter in a large nonstick skillet over medium-high heat. Combine 1/2 cup brown sugar and cinnamon. Add sugar mixture and apples to skillet; cook 5 minutes, stirring occasionally. Remove from heat; stir in 3 tablespoons flour and lemon juice. Spoon into prepared crust. To prepare topping, lightly spoon 1/4 cup flour into a dry measuring cup; level with a knife. Combine flour and 1/4 cup brown sugar in a bowl; cut in 2 tablespoons butter with a pastry blender or 2 knives until mixture resembles coarse meal. Drizzle syrup over apple mixture; sprinkle topping over syrup. Bake at 375° for 30 minutes or until apples are tender. Cool on a wire rack. The next step is to impress my new friend with my baking prowess. Well I can make the chili casserole. I think I will make that Sunday night dinner! It sounds divine and right now, well I want some =) Maybe I'll even try to make the chili from scratch!? Baking is my favorite thing too. Let's have a bake-a-thon night when we do finally get together!? Very funny Blog. I like it. Thanks for sharing a laugh! Previous Previous post: 18. Somethings scare me….